Four new hatchling battle pets (pictured below) will be available in Patch 7.1. 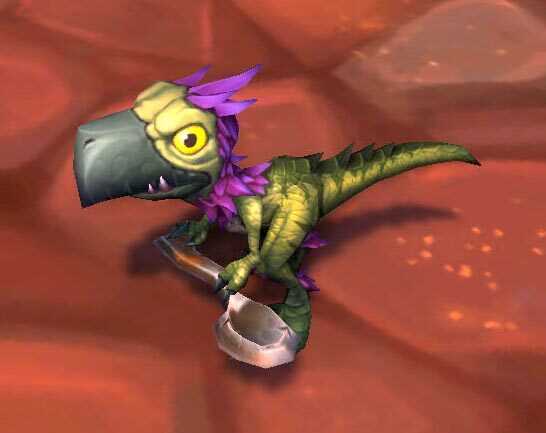 These falcosaur hatchlings are unique in that they are collected in special way, and they continue to provide content even after they join your battle pet family! Four new World Quests will appear on the Broken Isles in 7.1. These areas will be teeming with falcosaurs. Each species can be found in a different zone. Once you've located the hatchling, you'll find that you can interact with it. Unfortunately, these hatchlings are still shy and will not respond very much...unless you have its favorite food, that is! The description for each falcosaur pet in the Pet Journal hints at what type of meal the hatchlings enjoy. Pay close attention to the underlined text. All four foods can be purchased from vendors in the Broken Isles. You may want to pay a visit to food vendors native to each of the four falcosaur zones. Having the correct consumable in your inventory will cause a new prompt to appear when interacting with an orphaned falcosaur. Feed it and it will happily join your pet collection. But if you thought these pets were just for show...you're in for a surprise! Upon summoning each falcosaur hatchling for the first time, you'll notice something special about them — they have quests for you! The quests are account-wide, and you can have quests from different hatchlings active at the same time. 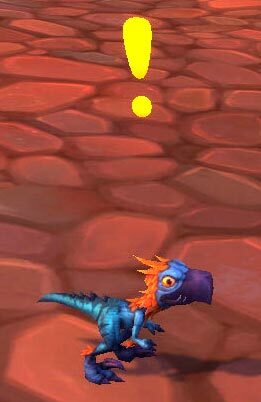 Traveling to different zones (old world and on the Broken Isles) with your falcosaur hatchling out. Completing wild pet battles using your hatchling. Completing World Quests (Pet Battle, PVP, and miscellaneous ones) with your hatchling out. Defeating a dungeon and raid boss with your hatchling present. 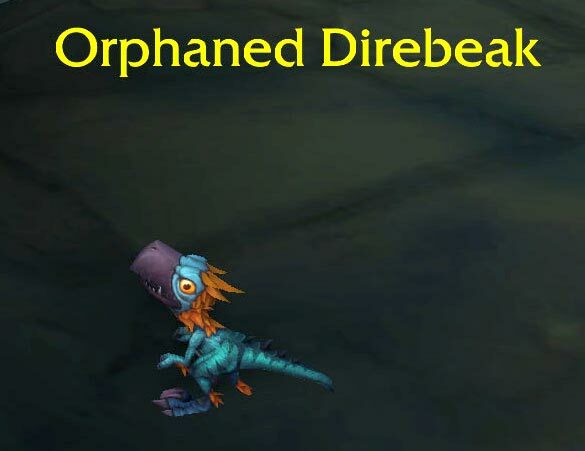 Buying an unlikely toy for your hatchling from Dalaran (pictured right). After completing each task, the falcosaurs will often need time to recover after so much excitement and adventure. Once they're sufficiently rested they'll have more quests for you. Progressing deep into the quest chain will yield an Ultimate Battle-Training Stone from each hatchling, however it's still unknown what the final reward of the entire quest chain is. We can't wait to find out in 7.1! Can someone have more than one hatchling appear at one time? Or do I have to complete all the quests with the first one I get first before anymore appear? I got my Direbeak Hatchling to lvl 25 yesterday but havent gotten anymore quests from him, is there something I need to do? Picked up the Sharptalon and the Snowfeather last night. The Sharptalon offered me his quest but the Snowfeather has not. :( I'm starting to get a little worried as I have already leveled them both to 23. Do you think I should hold back on the Snowfeather until the Sharptalon dings 25 and I complete his first quest? My thought process being that maybe I can't have two of the same quests going at the same time. Just got Sharptalon. He spawned up on a hill to the north of Matriarch. I did not have to feed him, which was weird, I just clicked on him and he went in library. I was impatient and frustrated and didn't pay proper attention so I had logged out before I figured out the pets are not near the matriarch per se. When I logged back in to check they were still there! And fav food is Smoked Elderhorn. Oh my, this sounds completely awesome! Is it known which foods are needed? The corresponding mounts were originally listed as reputation rewards. 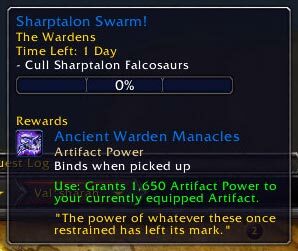 But now, they are listed as a reward for quest "(type name) Reunion", ie "Sharptalon Reunion" etc. Patch notes now say, raise falcosaur and get the mount of it. If you missed the announcement, 7.1 drops 10/25 ! Four pets, four quest chains, four... mounts? Sounds like FUN! I can only hope that I will be able to acquire these little tykes without pulling the rest of my hubby's hair out. (joking). I LOVE the idea of the battle pets being more useful than just battling other pets. I shall admit I don't have all of the Broken Isle pets yet, not even just the ones won by battling, but these four may take HIGH priority once 7.1 releases. Yep can't wait to see what's next after the epic stone, I'm betting mount versions of the pet! Ooooh I can't wait! This is very reminicent of the quest changes with the raptor and tiger mounts from Un'Goro Crater and Winterspring. EDIT: calling it now, the end reward is the mount version of the pet you're doing the chain for! This sounds just like the little quest where you had to take care of the baby raptor and then it grew up to become a mount. This sounds like so much fun!!! Do we know when 7.1 will drop?